Collectors love U.S. proof and mint sets. The allure of a complete set of coins, in beautiful condition and specially packaged is hard to resist. Once you own one or two of these sets you’ll want a complete collection. But along the way you’ll find a few holes that you just can’t fill, no matter how hard you try! The U.S. Mint didn’t issue proof sets in the years 1965-1967. Instead they substituted high-quality “special mint sets.” This transitional period fell between the last Philadelphia Mint proof set of 1964 and the first San Francisco Mint proof set of 1968. 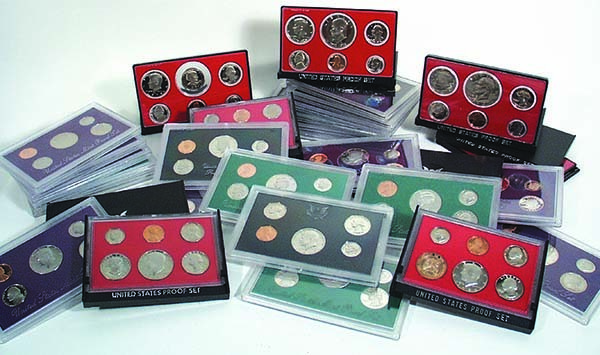 Like previous proof sets, each “special mint set” contained all five coin denominations for the date: cent, nickel, dime, quarter and half dollar (the 40% silver Kennedy type). These “hybrids” are a higher-quality form of mint sets and had mintages far lower than proof sets of the time. The coins were packaged in hard plastic cases unlike the earlier proof sets. No regular U.S. mint sets were issued in 1982 or 1983. It seems they were a victim of president Ronald Reagan’s cost cutting moves. Instead, souvenir sets were sold at the Denver and Philadelphia Mint gift shops. These sets featured five individual coins with special bronze mint tokens in an official envelope. These sets are limited in number. Over the years some dealers and collectors have compiled their own 1982 and 1983 uncirculated coin sets. They are packaged in a wide variety of ways and may even look very much like official sets. But they are privately assembled, as the only official sets that year were the 5-coin souvenir sets offered only in person at each Mint. U.S. proof and mint sets are a wonderful way to collect coins. Although these sets vary in price depending on availability, some are still very affordable. Start with those that are easy to acquire and work toward that full collection. As you go you can confidently add any of the sets mentioned above to fill the empty spots from 1965-1967 and 1982-1983. Happy coin hunting! This entry was posted in mint sets, proof sets and tagged Why no 1965 proof set, Why no 1966 proof set, Why no 1967 proof set, Why no 1982 nint set, Why no 1983 mint set. Bookmark the permalink.